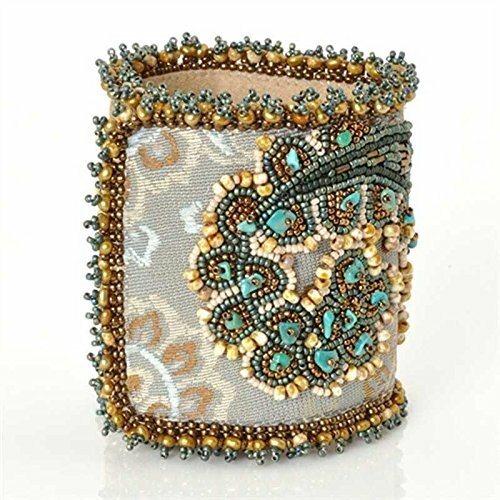 This is a Bead Embroidery Bracelet Project on Fabric. The Focal Bead is an Original Artwork Reproduction in Resin. The Mixed Media Piece was featured in Cloth Paper Scissors January/February 2011 magazine. This printed copy is 9 pages long and is full of detailed photographs and computer illustrations. Technique: Bead Embroidery, Brick Stitch, Mixed Media, and Embellishment. Skill level: Intermediate Bead weaving experience is recommended Supplies required: Resin, Glass Shards, Card Stock, Color Printer, Paisley and Solid Fabric, Pre-Dyed Lacy's Stiff Stuff, Scissors, Contact paper, 5-5mm Flower Caps, 5 Bronze Flowers, K.O. Thread, Spray Adhesive or Fusible Interfacing, E-6000, Ultrasuede Backing and Snaps Or Purchase: Pre-Assembled Mixed Media Kit. 3mm Pearls or Size 8 Seed Beads, Size 11 Seed Beads, Size 15 Seed Beads, 3mm Bugle Beads, 1.5 or1.8 mm Cube Beads, Chip Beads. Items needed & not included: Size 12 Beading Needle, 4-6 lb Fireline, Tacky Glue. You will receive a "Juliet" Printed Pattern.